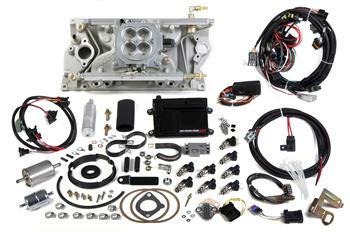 Avenger Multi-Port EFI systems for small or big block Chevys are ready for the street or strip with the simple swap of an intake! Whether you have a stock engine, crate or custom-built engine, Avenger Multi-Port systems can help you maximize performance and the Avenger’s self-tuning capabilities will get you to the cruise or race in no time. Avenger Multi-Port systems include: intake manifold, billet throttle body, ECU, wiring harness, fuel rails, injectors, fuel pump and related small parts. Set up is done on the included hand-held tuner so no laptop is required!